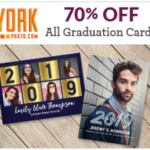 Order your Custom Graduation Cards and receive 70% OFF from York Photo. Use promo code: GRAD2018 at checkout. Shipping and handling: starts at $4.99. Ordered Online. Cannot combine coupon codes. Offer expires Monday, May 29, 2018.